AS CYPRUS’ economic crisis peaked last March, and with no money and no job, 24-year-old graduate Christina Melinioti, packed her bags and, like many compatriots her age, headed to greener pastures in Europe. Melinioti, who has a journalism degree, told the Sunday Mail. Before leaving her homeland, she had worked for a time at a cafeteria in Nicosia for 800 euros a month. Her job in Amsterdam pays more than double she said, adding that she is also happier with the standard of living she enjoys in the Netherlands. Cyprus which traditionally enjoyed full employment saw its unemployment rate rise after 2011 to two-digit figures for the very first time since the Turkish invasion in 1974. For two years now, the jobless rate has hovered persistently above 15 per cent. Younger people are those hit the most. 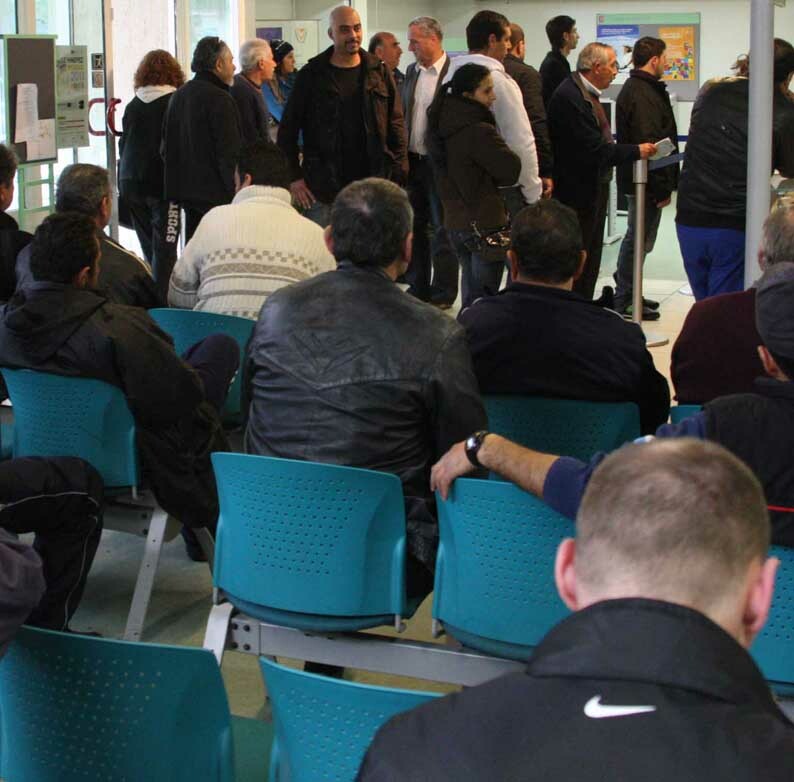 In June, Cyprus posted the fifth highest unemployment rate of people below 25 in the European Union, touching 37 per cent, according to the latest Eurostat data. Other university degree holders, who are still at home working in Cyprus, have to take jobs that require less skill and so pay less like Giota Koumourou who works in the reception of a Paphos hotel typing letters and answering phone calls. Koumourou, holder of a degree in economics, said she is also mulling going abroad if she could find a well-paying job. Cyprus’ economy shrank 5.4 per cent in 2013 and will shrink up to a further 3 per cent this year before it rebounds next year, according to the finance ministry. As a result, opportunities for unemployed youth in the foreseeable future are scant, with the International Monetary Fund projecting a 16.1 per cent jobless rate for next year. Cyprus, which was the fourth euro area member to ask for an international bailout in 2012, is now in its fourth year of recession. Not long ago, the island was a popular immigration destination for tens of thousands of East European workers after it joined the EU in 2004. The latest data on migration show a reversal of that trend. There was a sudden spike of emigration in 2012 when the number of Cypriots leaving rose to 1,050. This was more than five times the number of the year before when unemployment was on average just below 12 per cent. No information is available on the age of those who emigrated. According to Cystat officer Demetra Kosta, it is also not known how far the trend concerns young jobless graduates. But while the state appears to have no clear picture of whether the emigration wave is affecting mostly young graduates, a student union boss confirmed that there is a rising trend of young Cypriot graduates who opt to stay in the countries they studied in instead of returning to Cyprus. “Before 2012, the majority used to return to Cyprus after they finished their studies, but since then, the majority stays in the countries they studied to work,” said Nasos Koukos, head of Proodeftiki which is affiliated to AKEL and represents more than one third of students. “We are aware that we have lots of graduate students that leave Cyprus to find a job in another country, others never come back because they think they cannot find a job,” Koukos said, adding that he had observed some tentative signs of this while studying six years ago in the United Kingdom. Chances that the wave of emigration may continue and mainly affect younger people in the foreseeable future are increased as parents are advising their unemployed adult children to seek employment abroad. It is painful advice to have to give, harking back to the 1940s and 1950s when countless young Cypriots went to far-flung parts of the work to make a living, leaving behind tearful parents and siblings. For many, decades went by before they could see family members again. While cheaper flights, mobile phones, the internet and Skype now soften the blow of separation, the decision to leave can still be brutal. Vaso Papetta is the mother of three university graduates and has already encouraged her 26-year-old son Marios, who was unemployed for a year before leaving the island two years ago, to find a job elsewhere. “My son works in Qatar as an engineer and he gets paid pretty well,” she said, adding that she is now advising her two daughters Athina and Gavriela, aged 23 and 30 respectively, to follow in their brother’s steps. Gianna Demetriou, the 52-year-old mother of two, said that she too had encouraged her 27-year-old son, Adamos, and her 25-year-old daughter, Natassa, to seek better opportunities of work abroad. Ireland was the second euro area country to ask for an international bailout four years ago and saw its unemployment rate rise to 15 per cent in 2011 and 2012. Last year, when the country exited its bailout programme, it posted an unemployment rate of 13 per cent, according to Eurostat. Ireland’s jobless rate was 11 per cent in August. Frustration that can lead to emigration is also felt among young people with no academic degree when they discover that their entrepreneurial dreams have little chance to materialise. College graduate Andreas Andreou who finished his cookery training in 2006 and usually finds work in hotels and restaurants preparing meals for tourists mainly during the summer seasons, also hopes to find a job one day in another country. His wish is now stronger than before after his attempt to set up his own business fell victim to Cyprus’ problematic banking sector. “I’m one of the luckiest to be paid more than 800 euros per month, but still it is not enough money to make ends meet,” Andreou said, adding that even earning 1000 euros a month wouldn’t be enough. Andreou was planning to set up an own business in Nicosia that would prepare and sell loukoumades, the popular Cypriot honey balls. He applied to his bank for a loan to buy the necessary equipment. To his disappointment, the bank rejected his loan application. As a result, the dream of the 30-year-old cook to start a family one day, may come true but only when he finds a job abroad, preferably in Australia or Canada. Cyprus’ banks which lost 5 billion euros in Greece’s debt restructuring in 2011 have tightened their loan policy standards amid an increase of their non performing loan ratio to nearly 50 per cent in July. Under the terms of the bailout which were agreed last year, its largest lender, Bank of Cyprus, had to merge with the second largest lender Cyprus Popular Bank, and convert a portion of its deposits into equity.